Yelp, it’s that time of the week again. Another fun-filled day of physical and occupational therapy for Noah. 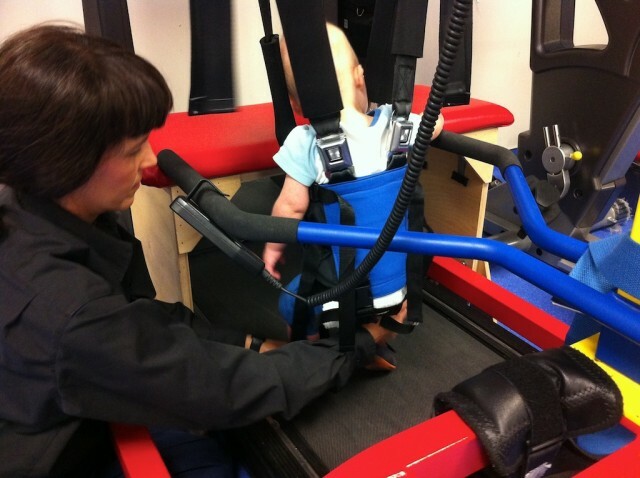 As you can see in today’s video his physical therapist is using treadmill training to help him learn to walk. Noah’s actually been doing it for a few months now, and it’s been neat to watch his little feet take more and more steps with each visit. When we first started taking Noah to therapy I wondered how long it would be before all of these trips became a huge hassle. He has to be here several times a week, and it isn’t like we have buckets of spare time just sitting around our house. The actual therapy sessions are the easy part (for us at least.) It’s the getting ready, driving across town, fighting traffic, scheduling our day around his appointments, and trying to remember to put shoes on his feet (this little boy does not like shoes) as we hurry out the door that’s difficult. We have to super glue his shoes on him while he uses the treadmill! How many times a week is your child in therapy? What’s one thing you (at frist) thought would be a hassle that now you count as a blessing? oops…that would be "using" and not "suing" (poor beach towels) haha! Normally I agree that therapy (between our two there is 16 hours a week) is no big deal. BUT in January we had 4 week days that didn’t have something on it and many days that had double our normal stuff. February is just as bad with some days tripled. So right now we are all a little beat and cranky. After all the specialists are done and we reach a more normal run, it’ll be better. My son, Anthony, has speech therapy, p/t, and his teacher..they all come to my house! no hassles there but for a long time, we use to drive about 40 minutes away for his playgroup and p/t- that was a hassle but everyone we've worked with has been wonderful- he has progressed in so many ways! Playgroups are fun! We used speech therapy when Noah was little for some of his feeding issues, and we're about to get ramped back up on that. How old is your son now? And what sort of things does he do during his pt and st? anthony is 2 1/2 yrs old…pt is mostly working on balance and climbing and bouncing with him-he is not much of a bouncer… speech they work on more receptive than actual talking,but i am hoping to get him morespeech therapy for him…Noah is adorable and i love your website!! Our Michael is three months old and has OT once a week and PT once a month. He is doing super! My husband and I are both PT's so we work on a lot at home and it makes a difference. We try not to make it too much of a boot camp for little Michael! 🙂 I love working with the pediatric therapists and I can truly say as a member of the profession and then on the patient end as well, that therapists truly love what We do and are genuinely interested and invested in our patients and feel priviledged to be given an opportunity to help improve the quality of life for those We treat. 🙂 I love watching Noah shine in PT! Thanks so much for the kind words. And wow…! and mom and dad who are PT's??? What a lucky little boy! Are you guys his therapists, or do you have separate pediatric therapists? Where are you guys from by the way? Great post! We live in a rural area, services are not ample but they are good at teaching us what to do. I did not go back to work after James was born so I could give him everything I could. We get speech once a month (although she pretty much just listens to him now) We just barely got PT/OT bumped up to 2X a month. The therapist comes to our house. Our pediatrician is going to also refer us to our local hospital once a month for PT there. It is not a hassle, because we have had the luxury of staying home for all of the visits. I have wanted more but they keep saying he is doing great. My daughter, Kara-16 months, has OT and PT therapy once a week. Speech therapy just started this week. I would like to have it more often, but am grateful for all they do for us. I wouldn’t have any idea of what to do otherwise. One of the great things, is that they come to our house…I don’t have to go anywhere. They will come until she is three years old. Another great benefit is that since it’s in our home, my other children participate. They take turns being present during therapy, and what a great advantage for all the kids to know what their sister is doing in therapy, because then they do it with her when they are playing with her. So even if I don’t have time, someone else is always working with her. Nothing’s cuter than when I hear my 4 and 6 year old daughter’s say “Let’s play therapy girls!”, or when my 17 year old son has Kara hold onto the back/bottom of his shorts and he “walks” her around the house. Love it. Wow…that's great! How old is your grandson? Also if you take a look back we've been posting therapy sessions for a long time ..in case you wanted to see some of the earlier ones. I'm so glad to hear his heart surgery went well. What sort of heart issues did he have? Rick Smith My grandson Chapman (we call him Chappy) is 8 months old today. He was born with tetralogy of fallot and also had surgery at 2 weeks for a duodenal stenosis. Heart surgery was performed on December 2, 2011 and all issues were successfully corrected. Praise God! We have been reading every post and find it our guidepost for so many questions and steps along the way. Many of our friends read too so that they can be better informed and as a sign of support for families like us! You are a lifeline! Hey Carol, I’m not sure if you are still checking this, but I believe you guys are from Augusta, GA. Is that correct? If so, I’d love to connect with Chappy’s parents about something.Would you mind asking them to send me an email. Thanks so much! Carol Mathias awwww..happy 8 month birthday to him! And I like rally like the name Chapman! Very cool! Thanks for the kind words about our site, 1 of the reasons for starting it was for just what you said. I'm so glad you guys found it. I'm so glad to hear he is doing well! Where are you guys from by the way? Rick Smith We are from Macon Georgia, which is about the center of the state and 90+ miles south of Atlanta. Not sure if we have the greatest of resources available in this immediate area, but will drive to Atlanta to "fill in" and get the PT and OT we need. Daniel is a week younger than Noah and has has PT twice a week and OT once a week. He is about to start feeding therapy twice a week as well. We are seeing big benefits and feel it is worth the effort. As parents we are learning how to make our playtime have a huge payoff with what we learn from his therapists. While some days can be a bit tiring, Daniel loves going out and seeing people. It’s been great to watch him win people over with his extreme cuteness and my husband and I are continually impressed with what a great kid he is. What sorts of things of you guys down feeding wise thus fan? Have you used (or heard) of the Z-Vibe? Dan didn’t have any trouble with sucking, but moving to solid foods has been challenging so that is what our sessions will focus on. We’ve had some success with scrambled eggs, refried beans, and mashed potatoes but Dan’s tongue doesn’t want to move anything more solid so he resists. Our therapist showed us the “J” method of feeding to help his tonque learn to move the food back and the Nuk brush for stimuating and encouraging the chewing reflex. We are going to work with those until the sessions start in a couple of weeks. I hadn’t heard of the Z-Vibe. I’ll ask our therapist about it. Thanks! Kristi: I am SO with you on the solid foods challenge! I’ve learned more about the difference between a “munch” and a “chew” and what “bilateral movement” is than I ever really wanted to know! James is 17 months and he’s been eating solid foods since 6 mos old…but we’re still on baby food. We’ve finally made it to stage 3 (or equivalent homemade) and feel pretty awesome about it. I didn’t realize how great it was to give a kid a cup of Cheerios to snack on until I couldn’t do it! Good luck to you! Celebrate all the small victories! I hadn’t tried scrambled eggs with James; thanks for the idea! Our therapist also uses the Z-Vibe and Beckman stretches (somewhere else on this site, I believe). That, and a lot of patience! As I’ve shared Dan’s challenges, it’s amazing how many other kids (not even just kids with Down Syndrome) have them too. I love the kinship on this blog but I am also thankful for all the other day care parents and care givers that share all their parenting challenges. ps. I’ve tried Cheerios and Fruit Loops even. Dan seemed to like organic animal crackers the best, but that just meant he would take a bite a spit it out. Gotta laugh. I’ll ask about the Beckman stretches too. Such great tips! Grace has speech/feeding therapy every other week, occupational therapy about every three weeks (eating and sleeping), plus a nutritionist (to monitor her weight gain and hypoglycemia) once a month. Thankfully, through our state’s early intervention program, they all come to our house at no cost. Now that she’s two, she’ll start a play group soon through the same program (Kentucky calls it First Steps). he is doing great how old is he? I look forward everyday to see what he does next m it brings a smile to my face.hugs to noah for the great work. Thanks so much! In this video is 9 months old. Thanks for following our story. Do you have any children of your own? Have you tried chiropracty? I think I spelled it wrong, but my daughter has been going since she was born and I think, I know it has made a big difference in everything, I’ll write more later…..
Hmmm I haven’t. Can you tel me more about it? It sounds awesome. He’ll teach you how to not take things for granted. He’ll teach you about life on a new scale. While most people live life on a scale from 1-10, you may get to experience a much larger scale. Damitri has therapy 2x a week for an hour each…the hassel is waking up but once were up were ok. he loves his tharapist!!! they hav so much fun 2gther!!! if she doesnt hav an appointment after his hour is up she’ll keep him an extra 15-30minutes!!! how cool is that?! This is super awesome! Noah’s PT does that for him also. That’s awesome that he goes for an hour! Noah goes to 4 – 30 minute sessions a week. I’m glad you have a good therapist now afte telling me about that one that you said “gots to go!” ha,ha! It sounds like you are doing such a great job with Damitri, it’s a blessing to get to hear all of your updates! I always look forward to them. As a retired pediatric OT, I have often asked parents where they think all these OTs, PTs, and SLTs come from. Many of us found our professions because somebody we knew or loved needed the services of those professions. We were either impressed with the therapists we knew or we saw the incredible needs that weren’t met and wanted to do our part. Not all of us have worn your shoes, but many of us have walked down similar paths. We do understand that some days, we are just about the last people you want to see. That’s life. Take a break and come back refreshed. Did you work with a lot of children with Down syndrome in you carrear? From my understanding a lot of people with Down syndrome didn’t go to therapy all that much several decades ago, and now there’s a lot more early intervention. What has been your experience with that? My Abbie started OT yesterday… I was a lil nervous cuz I didn't know if I should jump in and help or sit watching or if I would be in the way… but it turned out to be soo much fun for us both! I felt so helpless cuz everything I did for abbie wasnt working like it did with our other daughter.. the sitting and walking.. but now I learned more about abbies muscles and how she works them and have a better understanding what we both are in for. its wonderfull and she loves her OT. Next week we start the PT, Abbie will have OT, and PT once a week for a hour each day.. what's really nice is they come to our home! I wondered that, too, in the beginning: Do I sit by and watch, or jump in? Some days it's a little of both. As James gets older, I'm trying to step back a little bit, realizing at some point he will be going in by himself. But I really do learn so much by being in the room with him! In most areas, early intervention (or services provided to children under 3 years old) are meant to include the parent or caregiver. If you think about the number of hours in a day and in a week, then realize that your little one is only getting therapy for 1 hour each week, you'll know what we always said to be true…Mommies and Daddies are the first and most important teachers in a child's life! So, yes! You should be part of your little one's therapy. Ask questions, learn techniques, ask for ways you can work on the same skills at home and participate…that's the best way to be able to carry-over the activities on the days that you aren't in therapy, but want to keep up the improvement! This sounds like you’ve had an awesome experience. I hope our transition goes as smoothly when he gets to school age. We just had a son diagnosed with Down Syndrome at birth. Your blog has been such an encouragement to me. Thank you. James has 4 hours of therapy each week, though it's split up into three different days. ST/OT/PT and Developmental. We live in a rural area, but have a GREAT ranch just outside of town where our therapists work, called @Hope Landing. Developmental comes to the house. As a person who likes to go with the flow and not really have a schedule, I thought that all these days and times (and wearing a watch!) would be a real hassle. And some days it is, but it turns out I do okay with a schedule. And I'm really grateful for the structured time spent with James. As an unstructured person, he would not get that as much if it were just left up to me! Well, mine are past therapy age, and although they don't have down's they have similar charactoristics. My older one also had a mild fine motor delay. So at one point I had all three in OT and PT, plus preschool for the twins. Preschool was 2 mornings a week and I went with them because the preschool taught me a lot about working with them, and since they didn't walk until about 3 an extra set of hands was welcomed. The PT and OT were great about schedualling our appointments together and back to back. So one twin would be with her ot and the other with hers, then they would go to their own pt's or vice versa. The older one was on a different day, so I was out pretty much most of the day three times a week. I used to tell people that instead of being a soccer mom I was a therapy mom. But it becomes your normal and you just sort of do it. At first it's a bit of a pain, but then you see the progress and you know this is why you do it. Funny thing mytwins were about 2 when we started and we went for a year. They are 14 now, and they still remember going to their "play place with Bob and Helga", that's what they call it. I’m really surprised at the small number of therapy hours that the people posting have for their children. I have to assume that most people have very young kids and do not have special education services or speech therapy. In my area (Monroe County, NY) we are doing a lot of intensive therapy with our preschoolers through early elementary. It’s common for a child to have 5-10 hours of special education, 8-12 hours of speech therapy, 2-4 hours of OT & PT (each), and 1-2 hours of music therapy every week! Imagine if this was all in your house! Yes…we set all of this up inside of the house of a 3 year old and their family (occasionally a few 2 year olds). As a team, we basically take over an entire room (or basement) of the house, and turn it into a one child school. I know it sounds crazy, but you give us a few months of your time and we give you and your child all the potential we can see in them. And we raise the bar H-I-G-H! It’s definately not everyone’s cup of tea, but intense therapy does have it’s benefits. My son Luke is now 22 and rides his bike or walks all over town! He’s got the best calf muscles in the family from all his exercise! Amazing when I remember his low muscle tone at birth. He had a lot of therapies, for a lot of years, and it shows! All the work pays off! And taking a day off occasionally and staying home works too! Best to all of you new parents, it’s a bumpy adventure, but the best one ever! Wow Luke looks like an AWESOME guy! Thanks so much for posing his picture. Thanks also for the encouraging comments! Where are you guys from? We actually look forward to any and all the therapies. It is fun to see the passion and dedication of our therapists. We have a 5 hour drive (one way) every other week for OT and ST and a 1 1/2 hour drive (one way) for PT. It’s worth it though. We love seeing what new things the therapists can make Enzo do. It’s so much fun! Therapy is special “Play” time and Enzo truly loves it. It gives us a chance to learn something new while Enzo gets to “play.” It has opened our eyes to everything that is possible! And there is so much possible! Wow. Just found your blog love it. But makes me sad as to how little therapy the kids get here. Speech therapy in my area = 6 weeks on, 6-8 ( now more like ten due to non filled maternity leave) off. OT about the same, Physio a little bit more intense but the parents have to go to clinic, very few home visits. I feel blessed with how much therapy my daughter Joslyn (23 months) receives. New York is one of the best states for EI so I’ve been told. She gets PT and OT twice a week, speech twice a week, and special instruction once a week. The amazing part is they all come to my house. Some times (more than often) it is a bit overwhelming but I think about how how far she has come and that makes it worth it! That sounds awesome. What sort of things is your daughter working on now?